Okiedokie. I'll take your word for it! Haha! They certainly eat lots of hay, so we're in good shape then. I remember working at a petstore and back then there was the general consensus that the hay was a 'treat' and not to give too much of it. Now, it's basically all they eat! Do you have a hay rack? Or are you just dumping handfuls of hay in? I'm asking because it looks awfuly clean for having dumped hay in a giant pile. I have that ball thing with a bell on the end that is always full of hay, and then that paper bag is also full of hay, and there's a few pieces of hay that comes in their pellets. 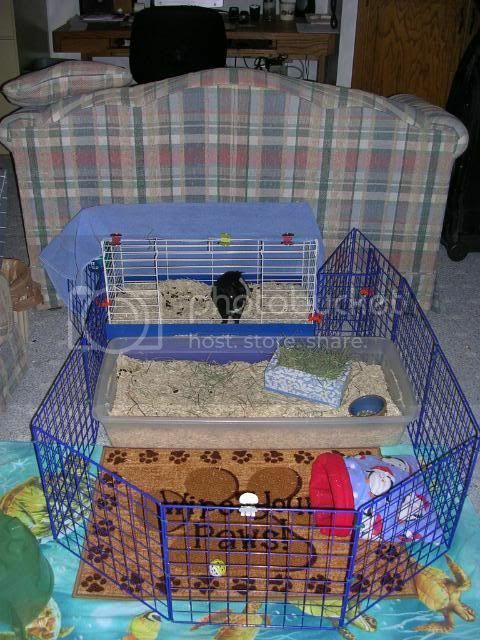 It's awfully clean because I vacuum the pig pen every night. ;) ...well, that...and I had just cleaned it prior to the pictures because of all the new ideas I got yesterday. You should see it this morning...hahaha! This is our new cage. Same dimensions but it has an aluminium frame so is sturdier. It is also on wheels. Boy, that's a nice set up. Is that your bun on the bottom? Wow! The new cage looks great! There are two buns in the bottom level. They are never permanently shut up. The doors were only closed for the photo. In our current house they had that plus approx 6ftx9ft of space 24/7. Now we are moving, they will get that plus their own room. Lucky buns getting their own room. Will the pigs get their own room too? pigsforlife, I LOVE your cage! Is it some sort of shelving unit? I would love to do something like that and use the extra shelves for storage! Lissie - the pigs are in the top two cages. Currently Ella is on her own in the top cage as we lost Toffee, her cagemate, on Christmas Day. After we get back from our holiday (7th Jan) we have organised to meet up with her potential new friend. The middle cage has 3 pigs (Lily, Acorn and Rosie). And then the buns use the bottom level as the home base. The whole cage will go into this room we have allocated for them. So I suppose you could call it the piggy/bunny room!! I will take pictures of the whole set up once we have moved. CodyNpatches - it is made from aluminium tubes. The tubes form the "skeleton" of the cage and are connected via 3 way and 4 way corner pieces. We cut the tubes to size using a saw (was very simple, much to my suprise). After that it was just a matter of putting everything together - a bit like lego. It is more expensive than a shelving unit, but I couldn't find any shelving units that were wide enough. This way we could customize it to suit our needs/wants. It looks VERY nice! Is it real tall? Do you need to stand on a stool to reach the top? Ha! I love all of your guy's cages and am reay quite jealous! I have the "extra large" cage from the pet store, but I'm really hoping that I can get a C&C cage soon. I have a ferret play pen type thing and am considering housing Penelope in there because that has a little more space for her to romp around in, but my dog would eat her at any chance he gets so I'm afraid that she is less protected in the ferret play pen. It is just over 4 grids tall so is about 150cm. I am 175cm tall so don't really need a stool for everyday cleaning. I use one when I am putting the bedspreads in though. We picked up the keys for the new house and are going to have to make some adjustments as this isn't going to fit through the door to the room we had allocated them!! Oops. Ha! 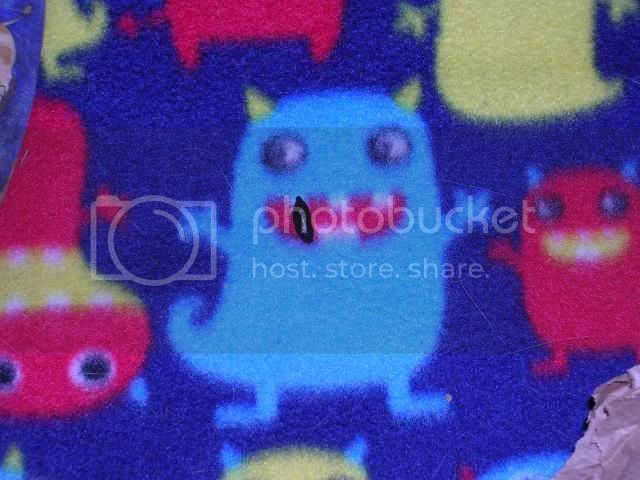 I love the poo esting fleece! 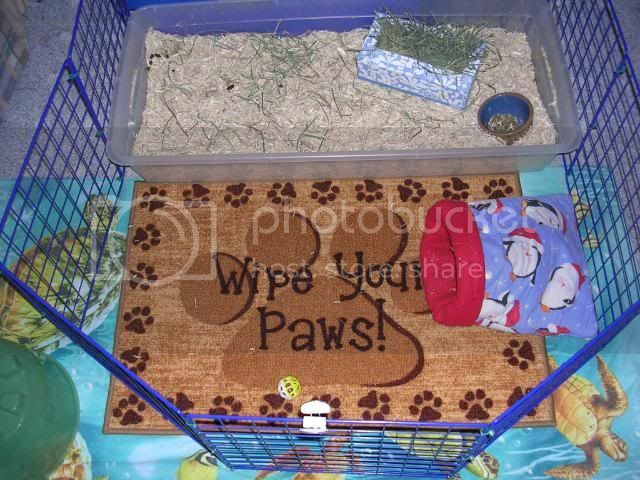 Hi there handsome :) I love his mat: "wipe your paws!" Hello everyone, immediately sorry for English mistakes, because I'm from Europe, Lithuania, English language second for me. In Lithuania isn't cube's. So I decided to make cage one of coroplast's [?]. Until now I has only one guinea pig. 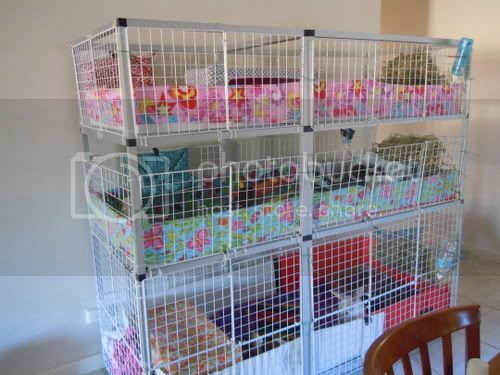 Is this cage for three guinea pigs? I love your cage! It looks great! And yes, it's big enough for 3 guinea pigs. Are you getting boys or girls? You will need more hidey houses for them. I have girl, and I will have girls ! Currently I have 1 house, 2 cozy beds. But i will have more. I want skinny and US Teddy guinea pigs, but in Lithuania is just Sheltie, Meirno, Texel, Coronet breeds pups for sale, so I search for guinea pigs which i want. That is a grat cage. Can't wait until you find your girls.